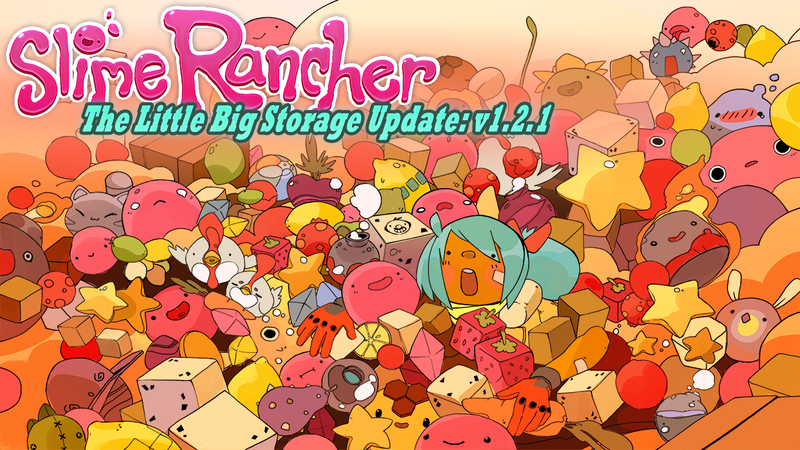 The Little Big Storage Update is now live on PC! I would be glad for this, if it weren't for the fact that I tried to decorate my gold gordo with echoes and it just swallowed them all up. And for the fact that I like the way my door looks with all the ornaments, even if I can't quite get into the ranch house... At least I can put other things in it. I don't really use silos, but I can see how this would be great for someone who likes to ride the plort market, or has a lot of echoes and ornaments. On the other hand, "Bursting at the seams" is now 3 times as hard to get. It definitely helps with the early game. I started a new file the other day partly because of this update to get the full experience using them. The additional space is a godsend. See, I'm one of those weirdos who has a specific layout in mind and refuses to use slimes and food until certain expansions are unlocked and storing them for later really helped. Little bummed we can't store slimes still, but I never expected that to happen anyway. The update was very welcome. Thank you. The way my Ranch is set up, I only have room for one or two silos, so I never was able to go the "Wait until plorts are super expensive before selling them" route. Now that strategy might actually be viable, since two silos can store every plort type and have 8 leftover. Very happy about that. I'm also glad that we can store echoes now, since having two many of those in one area seemed to be what triggered the disappearing slimes bug for me. Raxel920 wrote: I don't really use silos, but I can see how this would be great for someone who likes to ride the plort market, or has a lot of echoes and ornaments. On the other hand, "Bursting at the seams" is now 3 times as hard to get. Try 9 times, since not only does each silo have 3x the slots from before the update, but each slot has 3x the capacity. That said, I recall the changelog also saying that they revamped the achievement so you don't have to fill a silo with 3600 items to ping it--I'm assuming 400 would still be sufficent, but I have no way to test it as I've already pinged the achievement. it's actually 1.5x as hard. the details in-game says to fill each slot with 50 items. though now the title "bursting at the seams" hardly makes sense. PrismSlime wrote: it's actually 1.5x as hard. the details in-game says to fill each slot with 50 items. though now the title "bursting at the seams" hardly makes sense. Eh..., not quite. Do remember, especially early on, it's hard to carry 100 of a particular item, but you can definitely carry 3 at once. Sure, you need to bring more items, but it might still be fewer trips. Also, yeah, it might make sense to rename it. Not sure what to, though. Hoarder, maybe? I'm an Xbox One user, so I can't say what I think about it yet. But I'm sure it'll be soon. GravityCat wrote: It definitely helps with the early game. I started a new file the other day partly because of this update to get the full experience using them. The additional space is a godsend. See, I'm one of those weirdos who has a specific layout in mind and refuses to use slimes and food until certain expansions are unlocked and storing them for later really helped. Not only can we not store slimes (makes sense that we can't as slimes have housing lol), but we can not store NOR plant Gilded Ginger. THAT last bit is the real bummer as Gilded Gingers are hard enough to find as it is. The reward for finding one should be the ability to plant it, even if the harvest is only 4 of the root veggies. We worked to find it, we should be able to store those very rare roots as well. 10800 kookadobas are needed to max out a fully upgraded silo with nothing but tofu! You can store gilded gingers in a silo or warp depot. I really love the silo update! I always wanted to store more and more items, but didn't want to use to many silos. It's so much easier now to complete Quests (you can store every food and plort 300 times to always have enough of them) and to store plorts to sell them later or use them for lab. I also like the upgrade from 100 to 300 items for warp depots! You did a really good job with this update, thanks!! Yeah, it should be a 7Zee reward. That reward allows you to have a capacity of 100 items in one slot, not 150. That's 600 items, 1.5x the total capacity of the 100 Upgrade. What exactly are you trying to transport? Or, maybe, in the vacpack, if one slot is full of, I dunno, cuberries, then you could fill the second slot with cuberries. Basically, more than one slot could be filled with the same item. thank you! that place in the nimble valley were you COULD get stuck, i got stuck in! I had to escape! there is also a place by the docks, and i got stuck there on my first day! In the retreat I had a silo made composing of completely Heart Beets, and now I can´t even fill one storage compartment! Jerry is gonna be happy!